24 hours in a blasted, post-apocalyptic, internet-denuded wasteland – with cows… #narrowboat #England – The Diesel-Electric Elephant Company. Oh, there were ruddy marvellous vistas and utterly bucolic views, and even an absence of the damnable “Shroppie Shelf”, don’t misunderstand me. 😉 I mooched through the last two locks of Audlem’s fifteen and along a spot of canal to get there, but how can a chap be expected to feel plugged in to the human global buzz if he can barely see his emails and can’t upload so much as a trilogigabyte-sized photograph? Early(ish)-morning “ton-up” activity on the Shropshire Union. You don’t get me, I’m part of the Union. I have found the Union Gap. Tis easier to get a camel through the eye of a noodle, or some such nonsense. We picked our way through abominable countryside. English sheep, while they might look peaceful and vegetarian, have been known to leap thirty or forty yards into the air, and can cross canals in a single bound, if there is a tasty boater to be had. What was our reward? 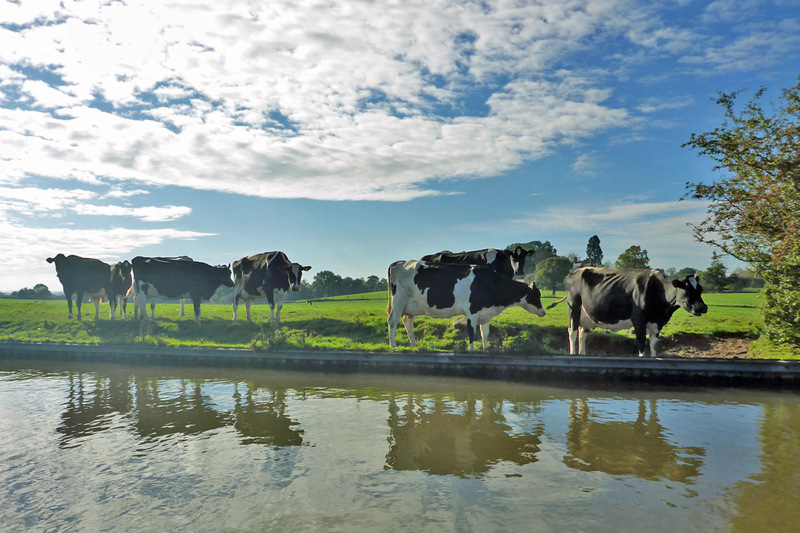 A cow-infested mooring, that was our reward. Why are cows so curious about everything? Why must they always make eye-contact? Yesterday’s moorings. Don’t worry, I told myself, they’re only on the offside. They can’t get at me to give me Chinese burns or anything. We are safe. Attack-Cow Gertrude, Special Agent, and I am certain that she could see right through the one-way glass. There were werecows on the towpath side too, and they began bellowing to one another across the water. ‘We shall fling cow-pats, and other dairy items’ came the cheery reply, and they did. Gertrude didn’t stop. She stared and she stared and she stared, and yet, somehow, she still managed to produce eight kilos of crumbly Cheshire cheese. I tried a walk in the countryside, away from t’canal, but even that hitherto unfailing panacea didn’t work in cow-land. Everywhere I went I could see the Cardinal, beset by even-toed ungulates. How can a chap and his narrowboat be expected to relax with all of that lactation going on? The middle of a cow is bad enough, with udders and stuff, but the ends aren’t exactly non-threatening – it’s all either meaningful eye-contact from the pointy-end or Niagara-esque urination from the blunt end with cows, oftentimes both (and still they lactate in the middle). I suppose that it must be said, and it may as well be me who says it. Moooooooooving on again was a necessity, not a choice. Gertrude never forgets a face, never forgives a grudge. No, archetypally England in extremis though it might have been, the Cardinal and I stuck it out for one night, and that was the best that could reasonably be expected from a chap. Mind you, we didn’t do a lot better in our moochings today. More of that anon. We are… urbanised. I am beginning to think that life with the cows may not have been so bad after all. Humans! Urban humans… ugh! Such suffering. It’s positively … bovine. You made me grin! Now there’s a job not for the feint-hearted – reading bodice-rippers aloud to bulls… Cows seem to be a weird mix to me. All knowing looks one moment, but then pooping and peeing in their own salad bowl the next. I have a rule that I won’t walk through a field if there are cows in it, no matter how peaceful they look. Some folk think that I’m nuts, and have said so, but I’ve read the official statistics on how many folk are trampled to dead and beyond each year by peaceful-looking cows! Perhaps I ought to carry a can of talcum powder with me and try again? Wow! Once again and too funny as always! I sometimes think that lack of internet is Nature’s way of telling you to take a reality check. Interesting reccommendation from Scottie raised my natural fear of Satellites once again; I once read how they can pin point you so accurately they can see goosebumps on flesh, but the negative side of it is that they also have the capacity to nuke you from on high – why else the sudden interest in reaching Space, it’s big, it’s very Big! Nothing stops me from writing, but then my primary creative source is the gel pen and writing book, all else flows thereafter like the lecky and the interweb! Excellent start for a Monday morning chuckle, thank you kindly! I am reliably informed that back in the olden days of chemical film aero-reconnaissance it was quite possible to price postage stamps and read newspapers held – no doubt that with the “advances” in technologee the satellites can now discern what we had for breakfast yesterday and tell H.M. Government our true religion. We are a very peculiar species indeed. Googloyl Earth is bad enough, and that’s certainly at the “cheap end” of the technology. We humans have so many toys – and no proper idea how to play with them! I believe you have misunderstood Gertrude. She probably has a small crush on you. That scenery is nearly too picturesque. I would have been pretty torn, as addicted as I am to the ether of the web, I think I might have found a way to ruralize for a bit in such a lovely place. Ta very muchly, sir! Tis much appreciated. 🙂 Tis strange that you should use the term “phantom”, given that my route today took us through a quiet wooded cutting which is supposedly home to a shrieking ghost… thankfully, the Cardinal and I heard nothing!